This Saturday we’ll be holding our meeting at the Hermosillo Club in Highland Park. Plentiful parking is available in the side lot as well as on the street (metered). If worse comes to worst, there are two public lots nearby. Since this is a pub destination, please refrain from bringing commercial beers, and please bring only one bottle of your homebrew. This is because we encourage you to patronize our kind hosts by purchasing commercial samples from the bar. As usual, please try to bring your tasting glass and a snack if you can. Yeastside Brewers logo glasses, while becoming scarce, are for sale, $8 each, $20 for three. Get ’em while they’re hot. The style of the month is Stouts. As far as this month’s Club Only Competition (“COC”), the AHA put an end to the March/April COC on March 1, the day before our meeting, thus preventing any participation in it by way of our Saturday meeting. Nevertheless, the May COC is still on the table (Extract Beers), and entries should be turned in at our April 6 meeting. Our knowledgeable officers and members will be available for consultation on COC strategy. Aside from that, any style of homebrew you wish to bring is welcome. We are here to share and discuss them with you, our fellow brewers. It is advisable to bring a copy of your recipe, too, because the technical details are very helpful in discussing and developing feedback and pointers. Previously, we’ve provided two updates on the AHA Rally at Stone Brewing in Escondido (ONE & TWO). 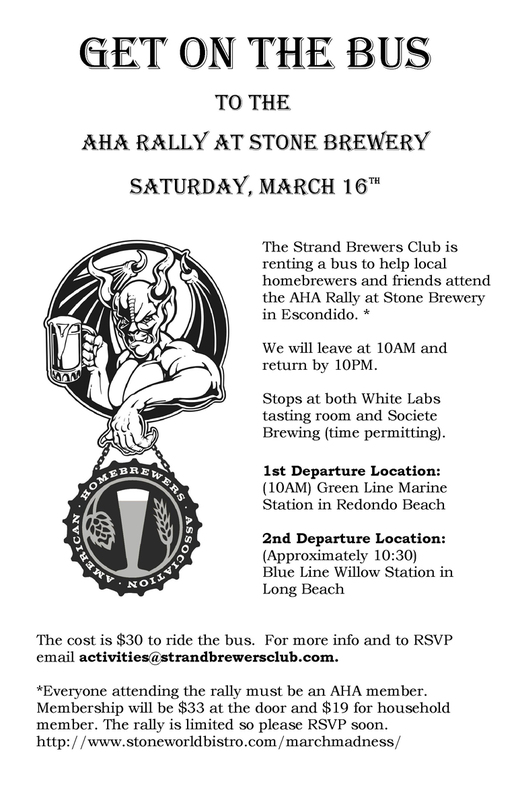 There will be a private bus trip to Stone Brewing on March 16th for the March Madness AHA Rally. This is being organized by the Strand Brewers Club. Several Yeastsiders will be competing in the competition that day. Only members of the American Homebrewers Association (“AHA”) may attend, and RSVPs have closed due to capacity. The winner of this competition will be brewed and released nationally, as Stone’s Pro-Am entry in Denver at GABF. Time permitting, the trip will also include Societe Brewing (substituted for Hess Brewing) and White Labs. There are now two pick up locations, one in Redondo Beach at the Green Line Station at 10AM and the other at 10:30AM(-ish) at the Willow Blue Line Station in northern Long Beach. The cost for the bus ride dropped to $30, thanks to favorable attendance levels. Tammy at Strand Brewers is handling the RSVPs and accepting the payment. She’s set up both a new flyer with details and an RSVP portal. You may want to reconfirm to make sure you are on the list. She is also taking money now, and if you have not already received the mailing address for that payment, then please reconfirm with her and she’ll send you the address. Tammy may be paying us a visit this Saturday if you have questions. Competition season is in full swing! Check the site regularly for deadlines. If you learn of a good competition that is not on our list, please let us know by emailing competitioncoordinator@yeastsidebrewers.org! * Mazer Cup entries are due March 1. That means Mead (honey wine). * AHA Homebrew Competition. Registration is open (Feb. 26), and entries are due between Mar. 18-27. * Mayfaire, brought to you by the Maltose Falcons. April 19th, registration closes! * Golden Road’s Pro-Am. Entries due between March 22-31. The 2013 SCHF is Saturday, May 4, 2013. Here is a recap of last year’s 2012 festival. If you wish to attend, RSVP with Jerl Leutz or Josh Jensen at the next meeting. We’ll be pouring our own beers for the first time under a Yeastside Brewers banner! We already have a campsite reserved, so if you are going, I encourage you to register as a CHA member, which is required to gain entry. Planning of this event is still in its infancy, but stay tuned for details! Thanks for reading! Happy Brewing, and we’ll see you on Saturday! Updates re Stone AHA Rally & 2013 SoCal Homebrew Festival! We have a few updates for you with respect to the Stone AHA Rally and the 2013 Southern California Homebrew Festival . We are taking a day trip to this event at Stone Brewing in Escondido! Please refer to my prior blast for the nitty gritty event details. In a nutshell, we are sharing a bus ride with Strand Brewers and some other clubs. Several Yeastsiders successfully submitted homebrews for the competition, so let’s go support them! After the rally, we’ll go to Hess Brewing and White Labs for your respective educational pleasures. * Ensure you are an AHA member. You can also pay for this at the Stone Rally, but paying in advance at AHA would be ideal ($33, though there is a spouse membership fee of $19). * RSVP to the Stone Rally on either the Stone website or at the AHA event page. * RSVP with Tammy @ Strand Brewers (bus organizer) activities@strandbrewersclub.com. * The cost of the bus ride has dropped to $30 per person payable to Tammy at Strand activities@strandbrewersclub.com. This is in addition to the AHA membership. * Plan for a 12 hour trip, departing West Los Angeles around 10AM, arriving at Stone in Escondido at around 1PM. For more info and to RSVP email activities@strandbrewersclub.com. The tentative departure location is the Metro Green Line Station in Redondo Beach. This may change, so stay tuned. We have room, so please come if you can. The fact that there is a bus will undoubtedly encourage more of you to come. It will make the trip safer and result in us having more fun socializing on the way down to Escondido! We sent our valiant club representative Victor Macias on a mission to retrieve details regarding this event at the latest Club Reps Meeting on January 26th. In a nutshell, this event is probably the best representation of what we homebrewers stand for. We take over the Lake Casitas Recreation Area for a weekend, pouring homebrew, camping out, barbequeing, potlucking, and just generally enjoying ourselves. The locale is one of the more beautiful places in Southern California, and the facilities are pretty top notch. I know some of you may not be huge fans of camping, but this is camping-lite. It’s a clean place, your vehicle is next to your site, and there are plenty of facilities at your disposal. Even so, there are some reasonable hotels in the area, such as in Ojai. There’s a shuttle bus among other special amenities for us festival goers. Last year was your current president’s first year going, and it did not disappoint. Many of our members have been going for years. * Yeastside Brewers will be participating this year, displaying their proud banner, and pouring their humble, yet sophisticated homebrews (the reason behind the jockey box project!). * The Bragging Rights-Only homebrew competition (BRO) for the 2013 Fest will be BJCP category 22, Wood-Aged beers. Each club gets one entry to be judged Friday on-site. Details to follow. * The Friday night mini-Fest’s commercial breweries this year will be Firestone Walker, Stone, possibly Hollister Brewing, and one more to be decided. * The CHA is encouraging clubs to pour on Friday night for the mini-Fest if we so choose. As was done last year, the Fest site will be cleared on Friday at 5PM so that all may be officially checked in (with photo I.D.) and receive their Fest wristband (don’t lose it!!!). Once that’s done, clubs can start pouring. You should carry your photo I.D. with you at all times while attending the Fest.Those not wearing an official wristband at any time cannot have beer poured for them–no exceptions. * Servers reserve the right to refuse service to anyone deemed underage or who cannot produce photo I.D. or who is intoxicated. * Speakers this year are Mitch Steele from Stone Brewing and possibly Gary Glass, Director of the AHA. * Purchasing your membership early will garner you a discounted rate which will decrease and finally expire as the Fest draws near. There will also be the possibility of earning your CHA membership by volunteering for a two-hour shift at the Fest, although these positions are often filled very quickly. Please visit calhomebrewers.org for more information. * The CHA also reminds us that the very same laws that apply outside of the Lake Casitas Recreation Area apply inside as well. In addition to the Park Rangers, Ventura County Sheriff’s officers will be on-site all weekend. No riding in the back of pickup trucks, no drunk driving, no drunk biking (! ), etc. It should go without saying, but please remember that you are representing your entire club (and all homebrewers) while attending, so please act accordingly. * There will be bands, but I am not sure if they will be homebrew-related. That is still TBD. * Yeastside Brewers has already reserved their campsite. Please RSVP by responding to this email or signing up with Josh Jensen at our next meeting. We will require a small deposit for the campsite rental. * Finally, if you or anyone you know has contacts at a brewery, the CHA is always looking for beer-related swag for the massive Fest raffle. Please contact them if you can help. Josh Jensen has taken up the lead on this festival. You can contact him or your president, Jerl Leutz, for more information about attending the Fest in the coming weeks. Please stay tuned. Wishing you all the best, and I hope to see you at both events!